Agenda Aaj Tak 2013 got off to a musical start with singer Sonu Nigam keeping audience enthralled for over 40 minutes. The session began with Mr Nigam, product of a television talent hunt show himself, syncing tune with Indian Idol Junior Aakash. 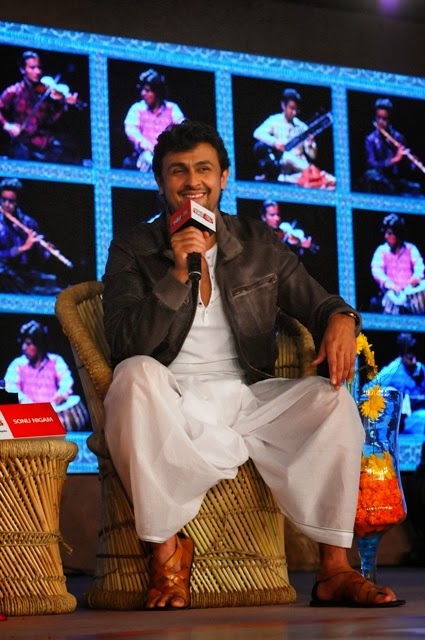 A candid Sonu Nigam had only words of praise for the current singing reality shows. “I don’t agree the shows confuse children. Reality shows, in fact, have pulled out strugglers from a hand-to-mouth existence”, said Mr Nigam. According to Sonu Nigam, the exposure has helped new entrants with a steady income stream. Mr Nigam rued the typecasting phenomenon in Bollywood. “I was earlier given only sad and slow songs. I had to struggle to be the voice of young actors”, claimed Sonu Nigam. Looking the eternal optimist, Mr Nigam said technology has helped singers with far less talent make it big in the film industry. “The voice should have a nice texture. Notes can always be mixed to create the perfect blend for a song”, revealed Mr Nigam. The highlight of the session, though was Mr Nigam joining former BJP President Nitin Gadkari to sing ‘Tujhse Naraaz Nahi Zindagi’. A hesitant Mr Gadkari impressed all with his rendition of the unforgettable number from Masoom.